Inquiring about the Alpen 20X-50mm Spotting Scope...? Does anyone here have experience with the Alpen 20X-50mm spotting scope? It’s campact in size but features a straight eye piece instead of my preferred angled eye piece. At it’s cost however, I was wondering how good it is... or isn’t. Please share your experiences. Thank you. Re: Inquiring about the Alpen 20X-50mm Spotting Scope...? Mine works good enough - 10 meters with air gun and a 50 yards with a .22. Quite durable, mine is 10 years old. The straight eye piece would drive me nuts. I like mine. It's a lot clearer than the zooms available for the same price. I think I paid $50 for it a few years back. desben wrote: I like mine. It's a lot clearer than the zooms available for the same price. I think I paid $50 for it a few years back. 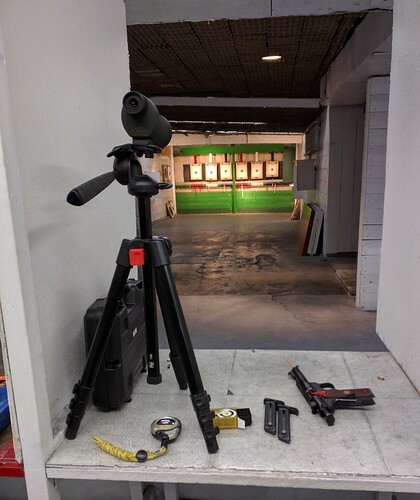 I see it’s an indoor range. Do you use it much at 50 yards? I've used it for 50 yards with no problem. 20x is the minimum magnification you want IMHO at that distance, especially with 22. But the clarity is sufficient to see the holes. Tim, I like mine also, it shows 22 in the black at 50 yds. I've never had an angled eyepiece yet, but you see quite a few on the line. Maybe when I improve to SS or higher, I'll splurge and get an angled one. I tried going to their website they went out of business. I googled it and the owners announced it in March this year. Damn it, I liked the scope and was thinking I'd get one of their angeled scopes in the future. They had lifetime warranty and all, oh well maybe somebody bought them up and will make em again.